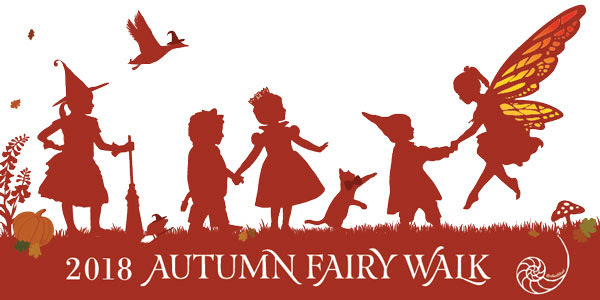 We are grateful for your spirit, drive and commitment that made this year's Fairy Walk so magical on Sunday, October 21, 2018. We had over 175 volunteers that pulled everything together with grace - from the unseen bakers and imaginative set designers and fantastic floral arrangers to our musical talents that captivated in three different locations, to our fortune tellers who told untold fortunes, to our myriad helpers in feeding the hungry crowds, pressing apples, passing out pumpkins, selling craft kits, painting faces, managing arrivals and departures, dressing volunteers, and to those who put on spectacular performances as sleeping princesses, wandering kings, bubbling witches and knights, knaves and queens. And those who magically returned the school to its proper order. Over 500 of you attended, walking through the maze in Dakin Hall to witness performances of Briar Rose, the Queen of Hearts, Double Trouble Witchery and the Midsummer Royal Court to surface into festive autumnal air filled with music by our own very local and elusive band - the Dusty Gnomes - and surrounded by hearty nourishment of soup by Joe Manzare, bread graciously donated by our own Jodie Geren from The Mill and savory (and some sweet) bites made by our community. After all that food, apple cider made by kids, parents and volunteers from apples graciously donated by Hidden Star Orchard via the ingenuity of Jackie Schwartz and coffee donated by Four Barrel Coffee (thanks again Jodie!) quenched your thirst. Finally, all were bid a fair adieu by persevering wizards at the end of the rainbow tunnel. We give thanks to you all. Cory Powers - for her tireless efforts at the Grade School everyday, and especially this past weekend from lighting design on very tall ladders, to ticket management, troubleshooting and knowing where everything was and should be returned to. Her knowledge, calm and smile got us through. The Royal Court performers made up solely of high school and grade school kids that for the first time at Fairy Walk put on a full production, reciting lines from A Midsummer's Night Dream, dancing across the stage and all around enchanting visitors. You were amazing! Dana Castro for filling in wherever needed, sewing capes, procuring sumptuous fabric for the entry, hanging it, braving the costume closet and committing Kevin to construct the rainbow tunnel. Jodie Geren for donating such delicious bread and coffee each year. Deborah Hull for stepping in at the last minute as we all became aware the Royal Court actually needed a stage director and then staying with and directing the Court the entire day. Joe Manzare for making soup for 500 year after year and managing so much more that happens in the kitchen that we sorely underestimate. Monika Leitz for her tireless support of the Fairy Walk since its beginning, for pulling together the Eurythmy witch performances a week earlier this year, and encouraging kids to display their theatrical talents in the Royal Court. Yoriko Yamamoto for dreaming up our new craft kit - the knit bird and providing the beautiful handwritten instructions and her own naturally dyed organic yarn. Aly Dinsmore, Janice Lucena, Jackie Schwartz and Mercy Manning for hauling large quantities of cornstalks, flowers, pumpkins, apples and cider and also volunteering on the day.